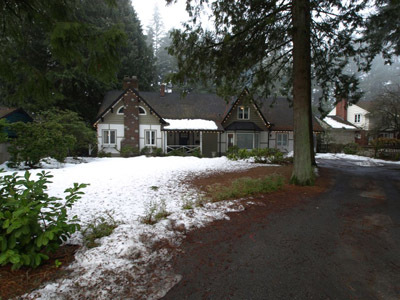 Capilano Manor is beautifully situated on the Capilano River, near the breathtaking Cleveland Dam and the Grouse Mountain Ski Resort. 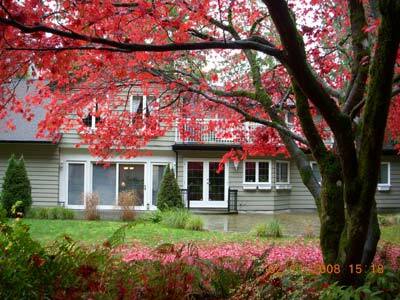 This classic gem is a 75 year old renovated and modernized home in a forested setting. 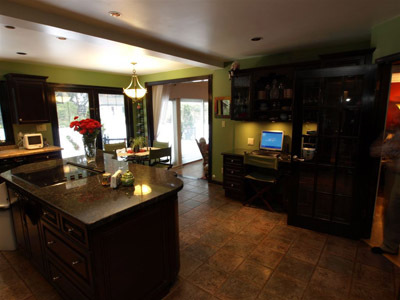 As you enter the spacious and welcoming foyer, you immediately feel at home. 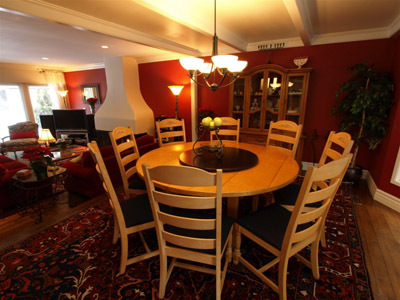 A wide entrance to your right welcomes you into the upscale country style dining room and the adjacent spacious, sunken living room. 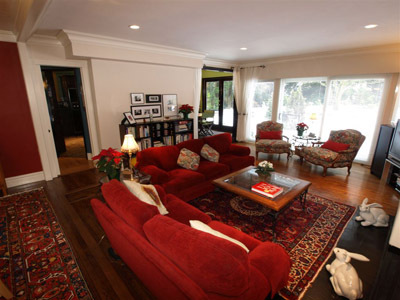 You'll enjoy walking on hardwood floors with beautiful Persian carpets and styled moldings grace the walls. 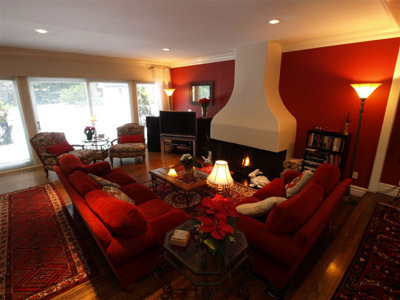 Adding to the heritage flavor of the home is an old fashion wood-burning fireplace to sit near and enjoy while reading or socializing with friends. From this room through wall to wall picture window you can view the gardens, a pond and the rich backdrop of the Capilano river banks sky high evergreen forest. For your entertainment there is a wide-screen TV, DVD, VCR and stereo so let yourself relax, settle back and be entertained. Adjacent to the cozy living room is the fully equipped spacious gourmet kitchen with a central cooking island designed for convenience and entertaining. With granite counter tops, glass breakfast table, counter high stools, dimmer lights, and country style windows overlooking the magical backyard, this generous kitchen has definite appetite appeal. 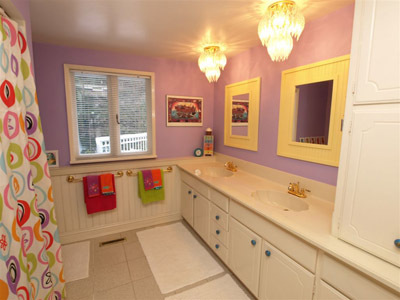 Also for your convenience, steps away off the kitchen is a 2 piece, cozy powder room. At the top of the oak staircase leading from the foyer, are the bedrooms. 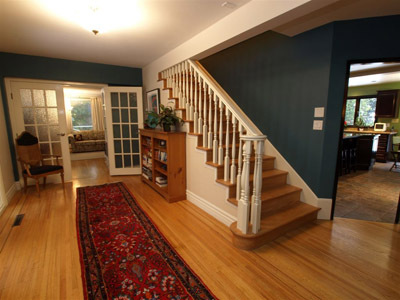 The large access hallway is decorated in pleasant lyrical colours and white French doors. 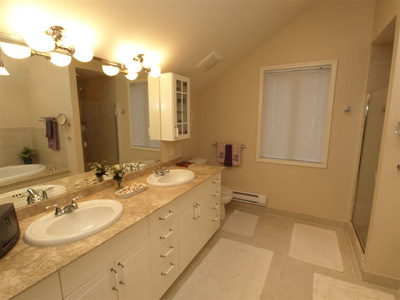 To the right is a comfortable 4 piece country style bathroom, with two sinks and ample storage space. 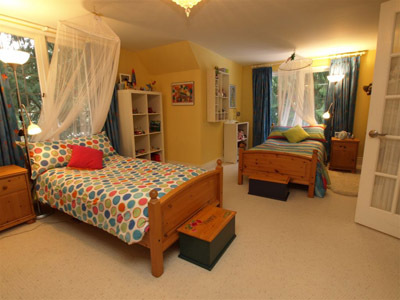 Right next to it, is a cozy generous, irregularly shaped bedroom with two queen size bed and one twin bed in an alcove. With soft and calming pastel colours and dimmer lights this room is truly restful. 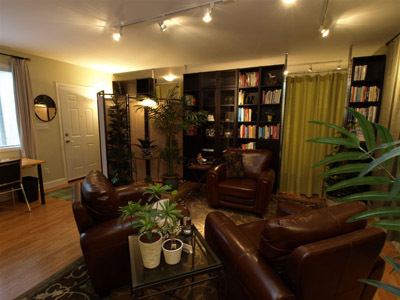 Further down the hallway to your left is the cozy library room. With white glass cabinets and soft yellow colours, you can rest on the twin adjustable bed under the slanted ceiling and the dimmer night-light. 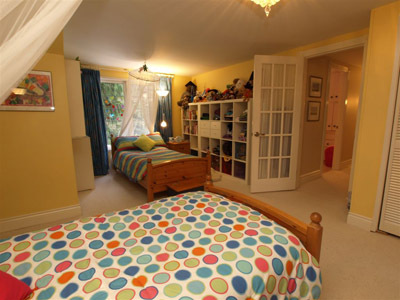 The third bedroom, at the end of the hallway is large and comfortable. 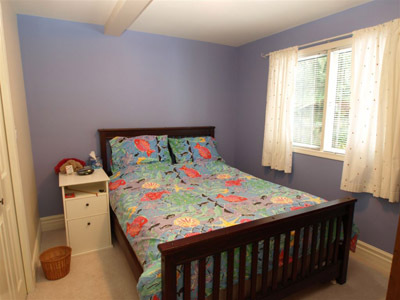 It is decorated in soft blue and has a queen size bed, dimmer lights and television. 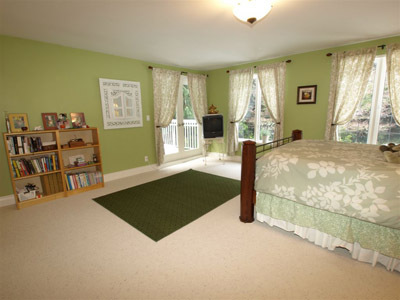 Also at the end of the hallway, behind double French doors is the spacious country style master bedroom decorated in a blend of soft green and warm white. 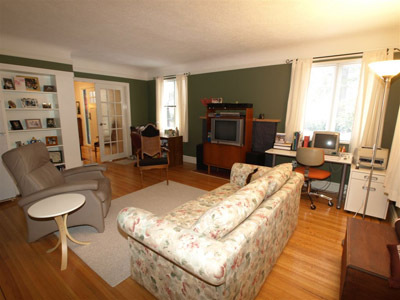 It has a comfortable high, queen size bed in mahogany and wrought iron design, dimmer lights and a television. Another set of French doors takes you outside to the balcony overlooking the magical, park-like backyard. 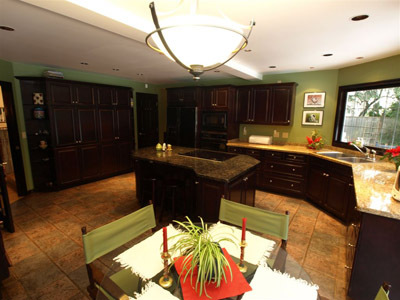 Conveniently adjacent are his and hers walk-in closets, and another set of glass French doors that open up to the spacious spa-like bathroom. 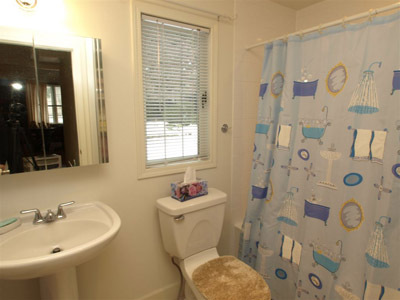 The master ensuite comes complete with a soaker tub under the slanted ceiling, marble countertops with double sinks, television, and a generous sized glass-door shower. 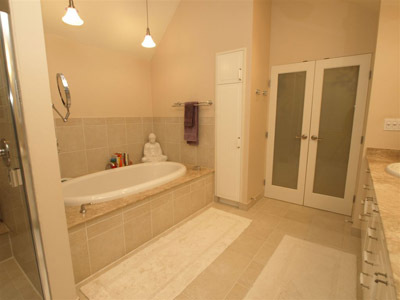 A truly relaxing Zen room for you to spoil yourself. One will not be without lots to do in this central location where the river, the mountain, the forest and city are harmoniously blended to create an enchanted retreat within easy reach to all amenities. 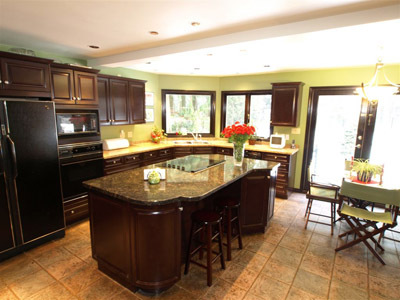 This is a truly unique property, ideal for a large family, a team, or a group of friends. This location is excellent for quick access to the Nordic Events at Cypress Bowl which is 15 minutes away. The Horseshoe Bay Ferry Terminal for Gulf Island and Vancouver Island trips is 10 minutes from here and the resort town of Whistler is 1.25 hours away on Highway 99. 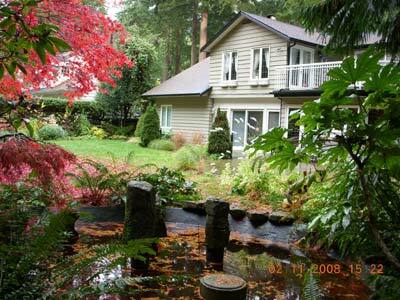 Downtown Vancouver is 10 minutes away by car and Richmond venues are 40 minutes away. Other attractions that are within walking distance or a 3 minutes drive are the spectacular Cleveland Dam Park and the Grouse Mountain Sky Ride that will take you up the mountain for skiing until 10pm. Shopping is also close at hand in North Vancouver along Marine Drive with a multitude of shops, services, cafes and restaurants all within 10 minutes easy drive.